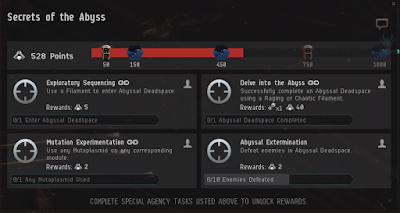 In a week in which CCP has dumped several botters, including a titan, in the high sec system of Yulai as part of the GM Week activities, I decided to dive into the Abyssal Deadspace sites. I don't consider waiting three months after the introduction of the Triglavians of the Into The Abyss expansion too long. I'm just fashionably late. Last week a new event, Secrets of the Abyss, launched. With the ability to get exclusive Triglavian SKINs and mutaplasmids for ancillary modules as well as skill boosters, now was the time to begin running the new content. None of my testing fits on Singularity could handle tier 3 sites, so I found a Vagabond fit online, downgraded a couple of modules to tech 2, and went shopping. 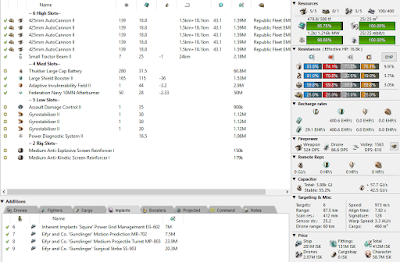 For the first time, I shelled out the ISK for faction modules and ammunition. I didn't have to spend as much as first appears. When I looked in my journal, I discovered I had 83,000 Thukker loyalty points, so I went to the nearest Thukker station instead of a market hub. I also retrieved large amounts of faction ammunition left over from my sales effort in Bosena. Plus, I had some of the tech 2 modules and an implant sitting around my hangars. Once I gathered everything together, I went to work. I looked on the market and decided buying filaments off the market was not for me. 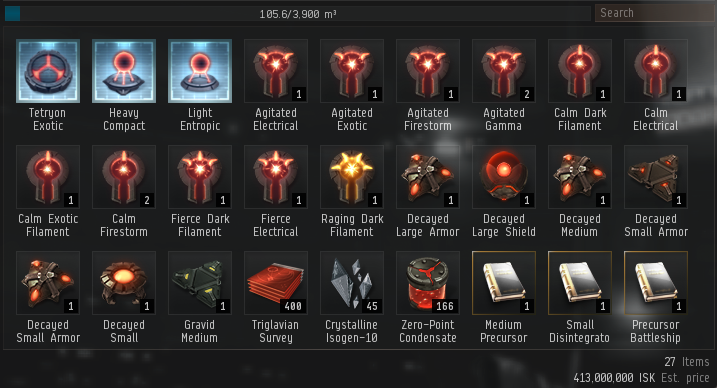 However, I did have 3 Calm filaments (tier 1) from when CCP handed them out with the introduction of Abyssal sites. I also found one in a data site, so I had four filaments with which to start. Over the weekend (Friday to Sunday), I ran 20 Abyssal deadspace sites. My initial 4 filaments turned into a cache of 5 Calm (tier 1) filaments, 5 Agitated (tier 2) filaments, 2 Fierce (tier 3) filaments, and 1 Raging (tier 4) filament. I had to look up what Traglavian Survey Databases were. The databases are a trade good one can sell to NPCs at CONCORD and DED stations for 100,000 ISK each. For those unfamiliar with selling to NPC buy orders, look for entries that have over 90 days remaining. I think some people have decided to make a little money by offering 70% in regions without NPC sell orders. One of the big questions about Abyssal sites when the new content launched was whether the content was worth doing. I did 13 tier 1, 4 tier 2, and 3 tier 3 sites in approximately 4 hours. 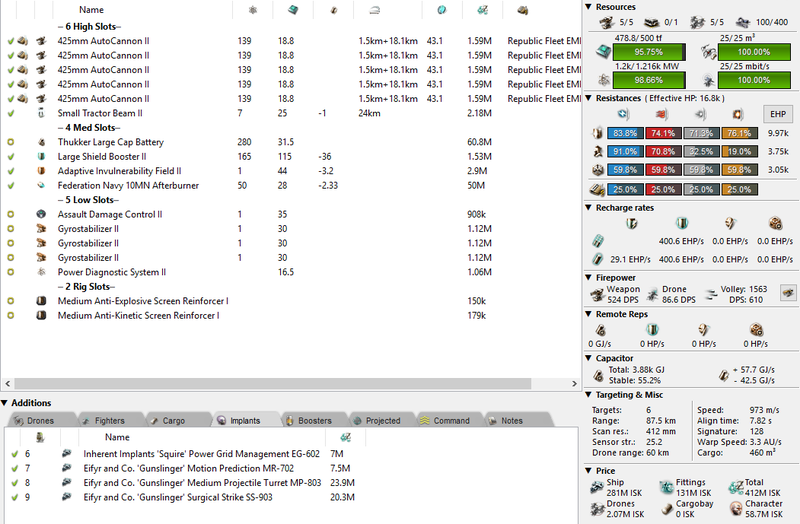 If the valuation in the UI is close to accurate, I made about 100 million ISK per hour, even taking into account the faction ammunition used and drones lost. The live event is pretty well put together. If a player just does one Calm and one Agitated site, the player is rewarded with a 24 hour booster (48 hours if Biology V is trained) that grants +12 to all learning attributes. I believe that doing one Calm, one Agitated, and one Fierce site each day guarantees 60 points for the Delve into the Abyss rewards, 15 points for entering the three sites, puts additional points for clearing each room and killing NPCs. Given that I managed to get 528 points running 20 sites, I'm pretty sure that just running those three sites each day will get a player 1000 points total. Just remember that at the end of each room to collect the points earned so you receive additional tasks to earn even more points. So far, I like the Abyssal content. The artwork is fantastic, the terrain meaningful, and the fights unpredictable. Which is good because that makes the live event more enjoyable. I might not think so after 100 sites, but I find myself wanting to do more. Perhaps when the event is over, I can take the time saved from not clicking buttons on the event UI to take some screenshots. The sites really are that good. A funny thing happens when EVE Online's Alliance Tournament runs each year. I spend so much time watching EVE that I don't want to play the game. Instead, I play a game where, if I get distracted watching a match and die, the penalty isn't so great. Over the past month or so, I've played a game on my bucket list, Elder Scrolls Online. I'm not really thrilled with either the combat or the questing in the game, but as a major MMORPG, I thought I should try to add ESO to the list of games in which I reached max level. Currently, the list includes Vanilla WoW, Everquest 2 (The Shadow Odyssey expansion) as well as the original versions of Star Wars: The Old Republic and Guild Wars 2. I probably would have quit ESO for the third time if not for the daily content. The big daily task that drew me into the game was training my mount. Every 20 hours, for the low, low cost of 250 gold, I can add either 1% to my horse's speed or stamina, up to 60%. Or if I don't want that, I can add 1 slot to my bag space, up to 60 slots. Of course, players can purchase riding lessons with real money to improve their mounts faster, but as a gateway drug, tending to a horse and watching him grow up is every effective. The second task isn't really a task at all. Every day starting at midnight UTC (aka EVE time), players who log in (or are already logged in) get a reward. Rewards range from experience scrolls, potions and poisons, soul gems, riding lessons, and lock boxes. That's right, lock boxes. Luckily, gambling is not something I'm interested in. But the other prizes come in handy. The third set of features involves crafting. I can do up to three crafting writs each day which not only helps level my skills but gives me resources to craft with as well. Speaking of resources, each day NPC hirelings can go out and send players crafting materials. I only have the skills for clothing and enchanting hirelings now, but as a staff user, will eventually do the same for woodworking. All of the above, however, only mitigates the problems I have with the combat and questing. Leveling just by questing or grinding just isn't a fun way to play. But each day, players can earn about 3/4 of a level plus get some nice prizes just for queueing up and running a random dungeon. As a healing templar, I just need to follow the tank around for about 10 minutes and spam some area of effect heals along with a couple of single target heals. Not only do I get the daily reward, but my gear is pretty good. My restoration staff is purple, all my light armor is part of a set (and blue) along with my jewelry, and the only green gear is one piece of medium armor and one piece of heavy armor that each give me an 8% experience boost on each kill. Added to the 8% experience boost my staff grants, let's just say I'm not worried about leveling my character anymore. I'm currently level 28, and given the rate I'm playing, may even reach level 31 by the end of the weekend. Of course, with the finals of the Alliance Tournament this weekend, I will probably start playing a lot of EVE again starting next weekend. But I can probably take at least 10-15 minutes out of my day to progress a little in ESO.